I have no patience at all, which is generally the case among gardeners. Summer has come to an end and I want the clutter out of the way. I want the garden clear of the herbaceous ghosts. I want to do away with imperfect spiders webs and the dank dead sticks they hang from. As with all gardening jobs it is nine tenths perspiration and one tenth swearing. New gardeners should be made aware of the pivotal significance of swearing. I visited Exbury gardens yesterday and as I wandered deep through the sombre Rhododendron the grey skies crumbled into torrents of rain. With the sang froid of a seasoned soakee I glanced skyward and said with cold determination "Oh, piss off!" I have no patience and I am fairly self-absorbed so the burst of laughted that followed from the other side of a hedge came as a surprise. It seems I was not as alone or as quiet as I had imagined. I'm not a great lover of Rhododendron. The heavy green foliage looks like the dignified setting for a funeral. The spring blooms are noddingly respectful. I don't get any fun from the flowers, it just feels as though the wreaths have been delivered. In the darkest depths of Exbury I spun around a Rhododendron corner, the sun came out and there was Camellia sasangua all shining springtime wiped free of spiders webs. I am convinced of the pivotal role of swearing. 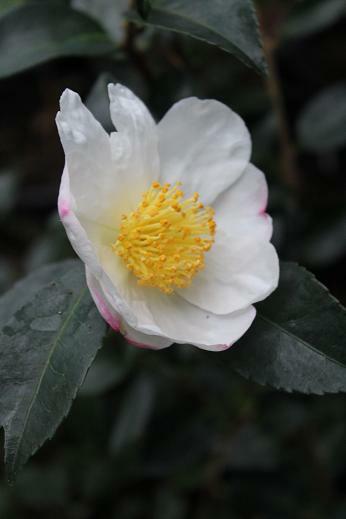 'Narumigata' has started the Camellia season in the garden. It is a selection of C.sasanqua from Japan, first recorded in 1898 but probably much older and it remains one of the best. It will flower for several weeks and by the time the last blooms fall I will be looking for flowers on 'Show Girl', a hybrid between 'Narumigata' and a form of C. reticulata. 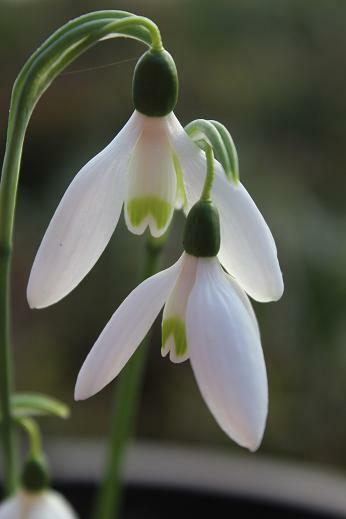 Snowdrops are the second suggestion of spring in the garden, although in the case of Galanthus reginae-olgae it is actually flowering in the greenhouse. It might grow outside in a rather sulky way but it is much happier under cover where there is some reliable sun and warmth. This was the first of the autumn flowering snowdrops to be discovered. Plants were found in the Taigetos mountains of the Peloponnese peninsula in the 1870's though the first plants introduced to cultivation in the UK seem to have come from Albania. I grew plants in the 1980's that were feeble. They produced tiny leaves year after year without ever seeming to increase in size. At the time I thought it was a feeble species but now I think we were all growing a feeble clone. More recent introductions have been vigorous and variable enough for a number to be given cultivar names. I have a vague idea that I will make space for a small collection of autumn snowdrops in the greenhouse but the small space available seems to be decreasing and the Nerine collection seems to be expanding. In April last year I was driving over the top of the moor on a narrow road between hedges. The day sparkled like cut glass and I remembered the summer, the same view alive with sweeping swallows cutting through the sky. I looked out of the car, hoping for swallows but it was too early. The idea was a pleasant suggestion of the joy to come, and that is the role played by autumn snowdrops. Days are getting greyer and the sludge of autumn is accumulating but winter will come, the garden will wash clear of sediment and there will be snowdrops. I have no patience at all. The weekend trip to Exbury was motivated by their Nerine collection, in full flower at the moment and looking astonishing. I spent a few hours last week looking round my own greenhouse for space that I could fit new plants into. In the event I managed an unusual level of self control and only came back with eight. They won't fit in easily, but they will fit in and there is space for them to be repotted when they need it. While I was away N. humilis opened. It is a small growing and variable species from the coast of the southern cape. Plants from the Western Cape are generally smaller than those from the Eastern Cape. In 1935 W. F. Barker published the name N. breachiae for a small growing plant but in recent years this and a number of other species have been absorbed into the concept of N. humilis. In cultivation they are sometimes referred to as the Breachiae Group but the differences that seemed to distinguish plants in habitat are not produced reliably in cultivation. 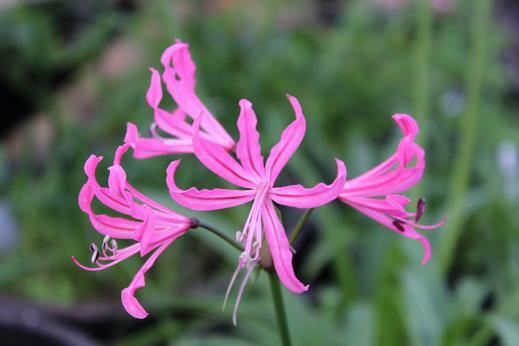 I don't need any excuse to like Nerine species but I particularly like the dark midrib on the tepals. I have also been told that the individual bulbs of N. humilis can produce up to three flower spikes which is another character I would really like. It has never happened here, but I would really like it. 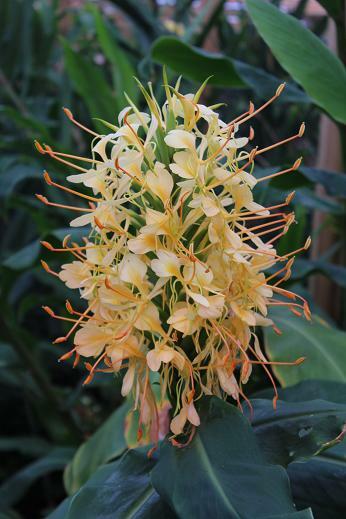 The Hedychium house starts each new season as a pile of dying stems and a lot of space. One of my favourite tasks of spring is clearing out the old growth and throwing great armloads of drying stems onto the compost. I wait for the first warm day, knowing that the Hedychium will feel it as well and start to respond. This year a mild winter and a long warm summer have lead to great things. 'Gardner Waters' arrived here in 2006 as a chunk of rhizome that was mostly cut surface surrounding a bulge that later became a growth point. It sulked for a long time and for many years produced interesting green leaves tucked away behind almost anything I could find to hide it. Eventually it flowered and I was slightly underwhelmed. A handful of yellow flowers and a lot of green bracts. Hot weather has suited it. This year the pseudostems have been as thick as my wrist and they all have great heads of flowers. It has un-tucked itself and it stands head and shoulders above the surrounding plants. If the weather holds the greenhouse will continue in perfumed excess until the end of the year. If we get a blast of cold weather it will degenerate into dank dead sticks and it will be time to let go of autumn and allow the old stems to topple and pile up across the pathway. Clearing them can wait until the snowdrops are over. That much patience I can manage.